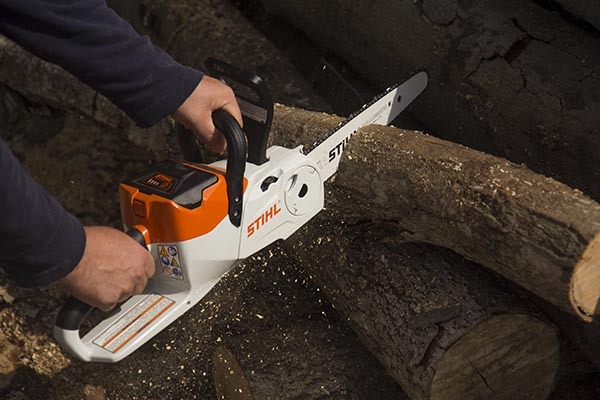 While STIHL is knows for it’s powerful and reliable line of gas powered chainsaws they also offer a wide range of battery powered chainsaws. 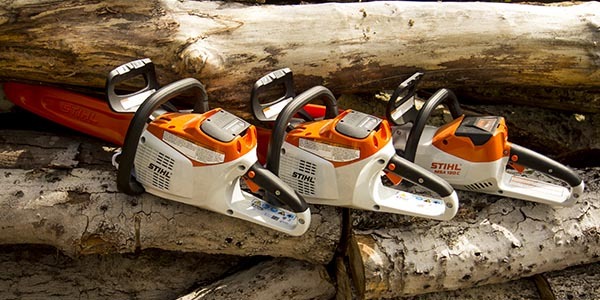 Designed with homeowners, maintenance workers and landscapers their lineup of battery powered chainsaws is impressive. We recently tested three different models across two different battery platforms to get a feel for power, performance and features. 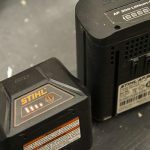 AI Series – Designed for quick and small projects the AI series is an integrated battery that is charged in the tool by attaching a charging cord. The AI Series offers a string trimmer, blower, and hedge trimmer. 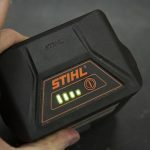 This series does not include a chainsaw, but it’s worth pointing out this segment of the STIHL battery platform. AK Series – The AK Series is a separate battery available in two sizes, AK 10 and AK 20 designed to provide longer run time, more frequent use, and a wider platform of tools. The battery packs are 36 volt lithium-ion packs. The AK 10 is a 36V, 1.4 Ah pack and the AK 20 is a 36V, 2.8 Ah pack. 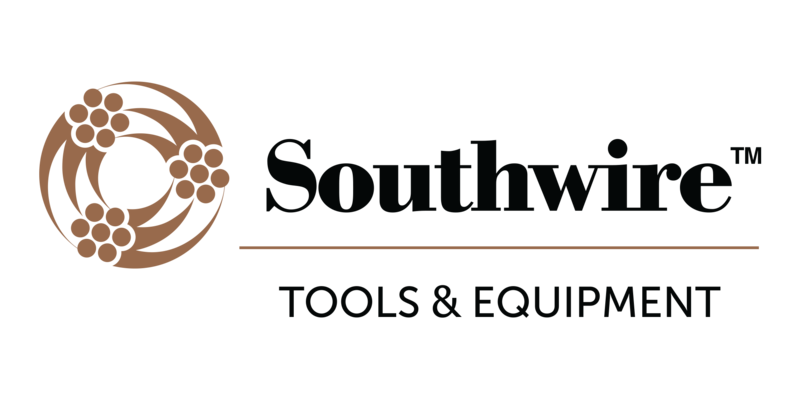 This series includes a chainsaw, string trimmer, hedge trimmer and blower. AP Series -The AP Series is their professional grade battery platform designed for heavy use across a wide platform of tools. The batteries are available in two sizes, AP 100 and AP 300. 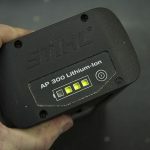 The AP 100 is a 36 volt, 2 Ah pack, while the AP 300 is a 36V, 6 Ah pack. MSA 120 C – This saw runs on the AK battery platform and we ran it on an AK 20 pack. 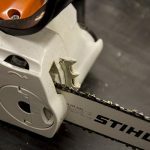 It comes with a 12″ long bar, 1/4″ STIHL PICCO™ OILOMATIC® chain, and weighs only 8.4 lbs (saw, bar, chain, and battery pack). MSA 140 C – While we didn’t test this saw, it was officially announced recently and it will be available with a new AK 30 battery pack. 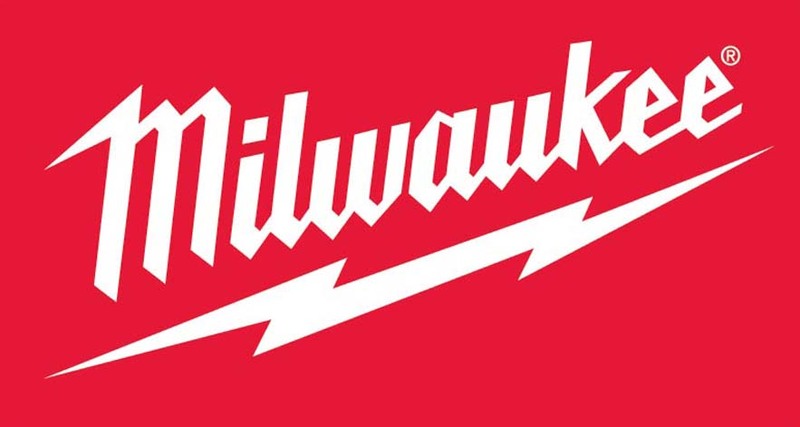 Boasting more run time it will offer users one more option in this line of battery powered chainsaws. MSA 160 C – This saw runs on the AP battery platform and we ran it on an AP 300 pack. 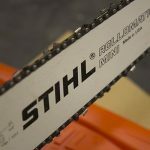 It comes with a 12″ long bar, 1/4″ STIHL PICCO™ OILOMATIC® chain, and weighs only 10.6 lbs (saw, bar, chain, and battery pack). 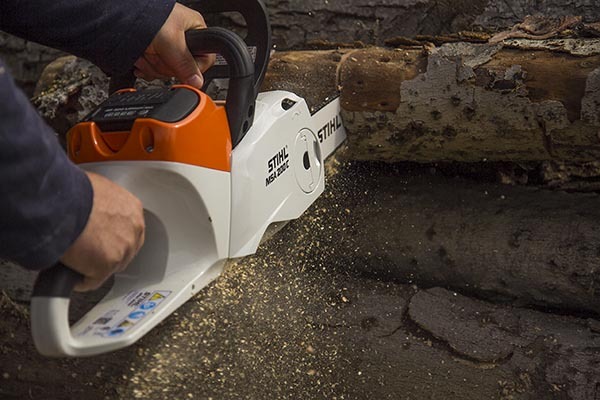 MSA 200 C – This saw runs on the AP battery platform and we ran it on an AP 300 pack. 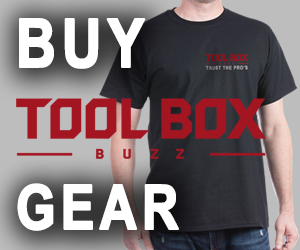 It comes with a 12″ long bar, 1/4″ STIHL PICCO™ OILOMATIC® chain, and weighs only 11.0 lbs (saw, bar, chain, and battery pack). 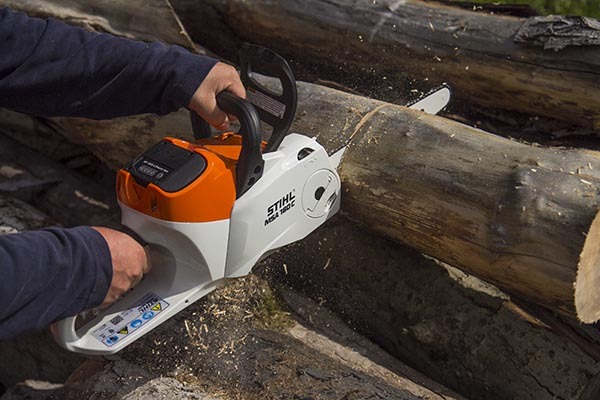 STIHL Quickstop® Plus (Q) – STIHL offers an additional, manually-activated chain brake on some models. This system is designed to engage when the operator’s right hand completely releases the rear handle, stopping the chain within one second. Available on some models. Ematic™ Lubrication System – The Ematic™ guide bar, when used with STIHL OILOMATIC® saw chain, will provide proper lubrication and less oil consumption than conventional methods. The system works because two ramps, strategically placed in the guide bar rail, help contain the flow of oil and direct all lubrication to the sliding faces of the bar and chain links as well as the rivets and driver holes, which in turn can reduce bar oil consumption up to 50%. Quick Chain Adjuster (QCA) (B) – The Quick Chain Adjuster (QCA) (B) allows the user to adjust the tension of the chain without the use of tools. This allows for easy chain adjustment. Coast-down Brake – A controlled braking device (Q) to stop the rotating chain when the trigger is released. 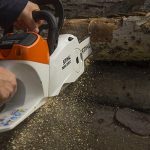 We’ve been using these STIHL Battery Powered Chainsaws for several months and everyone that’s tried them are really impressed, and some left speechless. When you first pick up the saw the first reaction is that it looks like and feels like a gas powered saw. The very next reaction is one of surprise when the trigger is depressed and the saw starts without lots of noise and the odor of fuel and exhaust. Lastly, the moment the saw bites into the log and you quickly realize the saw isn’t a toy, and it tears through the log with impressive performance. 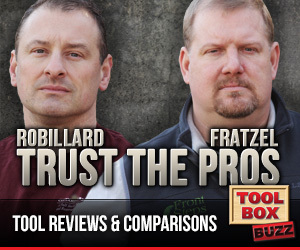 One of the keys to their performance is without doubt their 1/4″ STIHL PICCO™ OILOMATIC® chain. All three of these saws cut so well in firewood with ease. 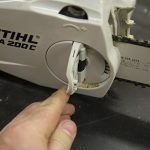 Unlike a gas powered saw, users need to be aware of any binding that would slow the saw as the battery powered saws don’t have the massive amounts of torque that the gas saws have. Having said that, when allowing the saw to do the work, and avoiding any binding the saw cuts beautifully and quickly. The real pleasure we found with using these cordless chainsaws is the lack of noise and smells. It’s hard to explain how nice it is to cut up wood with a saw like this and not be completely overwhelmed with the noise of a gas powered saw. It’s also a real pleasure not smelling the exhaust from the gas saws (although some may say they miss that smell!!). 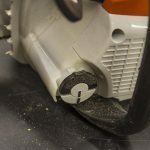 When it comes to yard cleanup, light landscaping, and property maintenance, these saws are an excellent option to gas saws. No small engine maintenance to deal with, no mixed gas to keep track of, and your ears will love you!